This is unlike any other beverage holders you have ever seen. Welcome the ORCA Rocket, the two-in-one, 12-ounce bottle and can holder that takes your icy cold beverage and keeps it that way. ORCA knows that there is nothing worse than a lukewarm beer or soda. 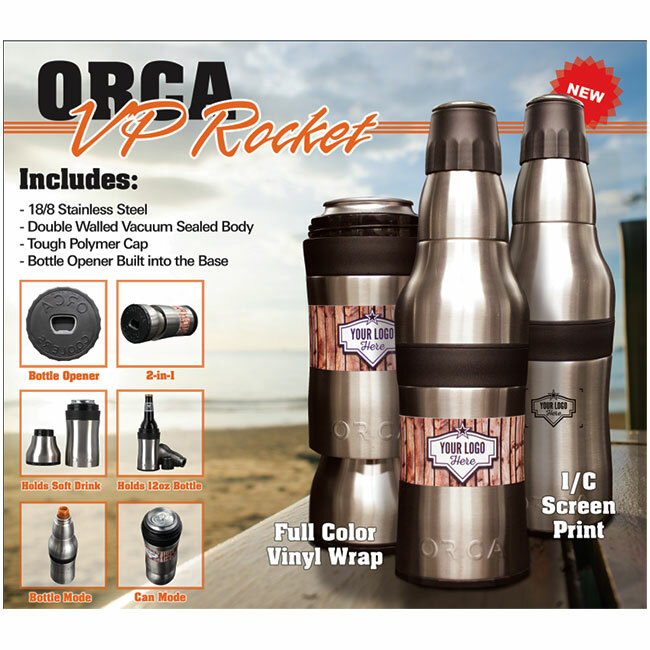 The ORCA Rocket is built to nest within itself and comes with a bottle opener in the base, which makes it perfect for the beach, the lake, a tailgate, and everywhere in between. With the ORCA Rocket you can rest assured that the last sip you take will be just as refreshing as the first. 18/8 stainless steel food grade body, tough polymer cap, mid-section and base components. Anti-microbial treated neoprene strips line the main chamber to hold both can or bottle firmly in place. Contact your Creative Associate for discount rates!